Let s check actual pictures from ongoing fair Light & Building in Frankfurt am Main. The fair will finish on 23th of March, so you still have chance to meet our OMS Team a get interesting information about our news in IoT technology. We are the first Slovak company, which present the IoT technology at Light & Building fair. Do not miss the chance to "experience" where the future of light is going! The light is not only light anymore. OMS has undergone significant changes over the last period. The company has gradually transformed itself into a technology-oriented company. What's awaiting us in the future of light will be presented to you at Light + Building 2018! Spiker, the award winning luminaire by OMS. On 29th May, the Slovak Design Centre announced the winners of the National Design Award 2015 competition at the award ceremony in Bratislava, Slovakia. Spiker, designed and manufactured by OMS, was awarded in the Product Design category. DUELIS, the award-winning luminaire Beside the OMS exhibition stand, you had a chance to see award-winning DUELIS presented at several places at the Light+Building trade fair in Frankfurt, Germany from 30.3.–4.4.2014. Lighting Psychology for Retail Success OMS Lighting recently showcased industry leading lighting solutions for the retail sector as one of the foremost exhibitors at EuroShop 2014. Find us at Euroshop 2014 OMS Lighting will showcase its industry leading lighting solutions for the retail sector as an exhibitor at EuroShop 2014, “The World’s Leading Retail Trade Fair”. CIE Israel 13 The Israeli Committee for Lighting Engineering March 6th 2013, Tel Aviv, Israel. Vladimír Levársky from OMS is the Entrepreneur of the Year 2012 Vladimír Levársky, CEO of OMS became the Slovak Entrepreneur of the Year. Designblok 2011 OMS presented top class of ELITE OMS lighting at the national design and fashion tradeshow, DESIGNBLOK 2011 in Prague. National design prize 2011 Results from the 10th Annual National Design Prize 2011. May 24 - June 3, 2012, Bratislava, Slovakia. The Days of Architecture and Design (DAAD 2012) was held in Bratislava for the third time, from May 24th to June 3rd, 2012. The project’s goal was to increase awareness for Slovakia’s impressive architecture and design. OMS presented future product ideas that were first introduced at the 2012 International Light & Building 2012 Exhibition in Frankfurt am Main, Germany. As part of DAAD 2012, OMS and The Academy of Fine Arts and Design’s Atelier of Industrial Design hosted Summer Exhibition 2012 in Bratislava. The exhibition, “The Luminaire as a Tool for Commercial Lighting 2012-2017”, featured prototypes and concepts designed by the Atelier’s students as part of their summer project, led by Dr. Ferdinand Chrenka. In addition, the students’ work was presented alongside OMS luminaires at Light+Building 2012 in Frankfurt, Germany. Department of Product Design, Atelier of Industrial Design Doc. Ferdinand Chrenka akad.soch. April 15-20, 2012, Frankfurt, Germany. OMS joined the ranks of world-class exhibitors at Light+Building 2012 where it presented its latest products and innovations. For the fourth consecutive year, OMS joined the prestigious event that focuses on new trends in lighting technology, electrical engineering, architecture and technical equipment for buildings. “We competed with the best in the field of illumination and have since grown to become one of them. For this reason, we could not miss being part of this event in Frankfurt,” said Vladimír Levársky, CEO of OMS. OMS introduced several innovative LED luminaires at Light+Building this year. Attendees also had the opportunity to preview a special OMS truck, which will tour Europe this Spring and Autumn for OMS’ European Lighting Tour 2012. A significant part of exhibition was dedicated to OMS’ proprietary new Lighting Quality Standard (LQS). “We are using more than 20 objectively quantifiable criteria to evaluate each and every lighting product or solution for a given space,” explained Mr. Martin Bílek, co-author of LQS and head of the lighting division in OMS’ research and development department. LQS’ goal is to standardize the evaluation of lighting solutions in order to facilitate proper lighting selection for customers. April 15-20, 2012, Frankfurt, Germany. OMS showcases innovative design concepts during the Design Plus Awards. The ceremony brings together highly qualified professionals in the fields of lighting, electrical and electronic engineering as well as home and building automation. The winning products will be awarded a prize and named “Best of” in their categories. The awards will be held at the exhibition area in Hall 1.1 on Sunday, April 15, 2012 at 4pm. Track Comet is one of OMS’ upcoming products. Functionality, reliability, design simplicity, and respect for the environment are the stand-out features of this luminaire. The body of the lamp; two massive aluminium blocks, serves to transmit heat and visually communicate the luminaire’s long product life. Efficient light output and lighting efficacy are obtained through the use of LED. In comparison with discharge luminaires, Track Comet’s biggest advantage is its reduced energy consumption. Its silent and noiseless operation is obtained through the use of passive cooling. Track Comet’s low heat production and energy efficiency are typical features of this luminaire. Easy to mount to any kind of track system, Track Comet features two levels of adjustment: 0°-90° or 0°-360°. A LED with CRI>80 combined with an effective reflector provides light output of 98 lm/W. Colour rendering can provide colour temperatures of 3,000K or 4,000K. Track Comet comes with two types of reflectors that produce beam angles of 24° or 40°. It fits into spot lighting in shops or galleries and can also be used in product display areas to highlight merchandise. Track Air breaks down the barriers to mass market adoption of LED lighting solutions. We designed Track Air to take full advantage of the benefits of LED, making it a safe, long-lasting, cost-effective and environmentally-friendly lighting solution. The luminaire′s housing is formed from black sheet steel. The dimmable electronic control gear, DALI, is available on request. Track Air’s global track system supports various types of connections and suspension equipment to be set up on one track. It can be suspended or ceiling surfaced. Compared to halide luminaires with an output of only 35 or 70 lm/W, Track Air’s LED with CRI>80 combined with an efficient reflector provides an impressive light output of 98 lm/W. Colour rendering can provide colour temperature of 3,000K or 4,000K. A LED with CRI>93 is available on request. Track Air comes with two types of reflectors that produce beam angles of 24° or 40°. An active membrane is used to transfer the LED’s heat which reduces the weight of the luminaire. It is perfectly suited for use in galleries, exhibitions and retail applications as the luminaire can be positioned precisely where required. OMS has always prided itself on the quality of its products. Now starting our third decade of luminaire development and manufacture, we believe that a good product not only provides the best technical parameters and latest technologies but also ensures the safety of every user and building. One of the key ways in which we strive to meet the highest standards is by attaining the respected ENEC mark for our core products. The ENEC (European Norms Electrical Certification) Scheme covers thermal, mechanical, and electrical safety requirements across all electrical product sectors. The highest quality independent testing is carried out by one of more than 20 signatories, all of whom are distinguished laboratories or certification bodies and members of the EEPCA (European Electrical Products Certification Association). Achievement of ENEC certification means that a product both meets strict European electrical safety standards and provides a required operational performance in accordance with European legislation. OMS became a member of the ENEC Scheme back in 2000 and has been working to meet and surpass standards ever since. Anton Kozubik, Head of Product Management and Marketing, commented, “Our use of the ENEC mark assures customers of the technical performance and safety of our products, which reinforces trust in our brand and the quality it represents on the market.” We currently have our products certified in three independent laboratories: EZÚ Prague, Czech Republic (ENEC 21), TÜV Hungary (ENEC 18), and EVPÚ Nová Dubnica, Slovakia (ENEC 27). 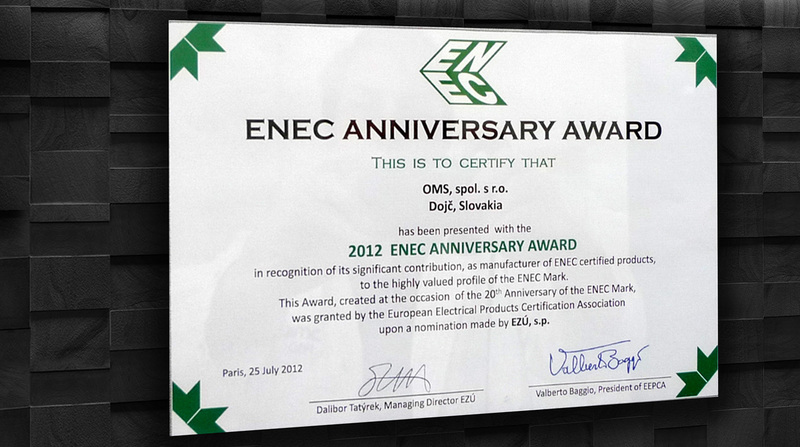 To mark ENEC 20th Anniversary in 2012, Execom (the European Certification System (ECS) Executive Committee) asked the then 25 signatories to nominate several companies each for recognition. The criteria included such areas as innovation and product quality. Of 125 nominated companies, only 35 were awarded the coveted ENEC Anniversary Award. OMS is proud to say that it was one of those 35. Together with our key partner in Russia, TD Intersvet as well our Belarusian partner GVA Lighting, we showcased the OMS and UNOLUX. brands to companies including Mobilight, Corso Luce, EKO SVET, CTK System and Gema Motors, to name a few. The meetings were instrumental in giving OMS a greater understanding of the Russian lighting market including its existing lighting solutions and future needs. Despite of unpleasant weather which already rules Russia, the meetings and negotiations were passing effectively in every case. 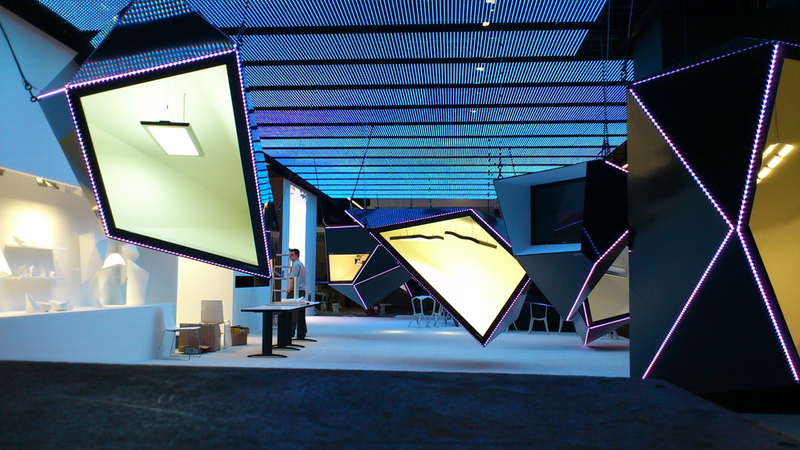 OMS presented top class of ELITE OMS lighting at the national design and fashion tradeshow, DESIGNBLOK 2011 in Prague. From October 4-9, OMS took part in DESIGNBLOK 2011 in Prague. The exhibition took place at pre-selected showrooms, stores and galleries in Prague, and our exhibition was held at Superstudio Futurama in Prague – Karlín. A Lighting section was presented by OMS’s new Elite brand as well as strong design brands such as Deltalight, Artemide, Flos, Light Years, Brokis, Luceplan, Lasvit, Foscarini, Preciosa, Lucis, Ateh, and also by technical lighting producers such as Anolis, Lux Lighting, and many other “green” designers and students. The goal of our presentation was to confirm and showcase OMS’ long-term strategy in product development with an emphasis on design. Junior designers, journalists and well-known professional designers expressed enthusiastic interest in our display. The display’s author, Petr Mikošek from Boa Design, based his work on Elite colours. The audience’s appreciation of OMS’ Elite brand was evidenced by our nomination as a finalist for The Best Lighting Collection award, alongside Brokis and Preciosa. Our nomination validated the high quality work of our internal and external designers. The most remarkable products of our collection included Startrack (Atelier Pelcl) and Rebell (Ján Štofko, OMS) from the winning NDA 2011 collection as well as Acrux (Anton Zetocha, OMS) and Terzo (Guigiaro Architettura, Italy) from the new product collection. Minimalist models such as DW Castra, Modul Box Max and recessed Becrux also received attention. Those who prefer touch displays were pleasantly surprised by Modul Eye functionality. showing that high quality industrial design can stand next to jewelry and fashion design. Results from the 10th Annual National Design Prize 2011.